September 11th is a day that we all recall in our own ways. It is a strange day for New Yorkers. So many were touched by this tragedy. Today many talked about how it was an eerily similar day eleven years ago — a crisp morning, clear blue skies. I was a sophomore in college when 9/11 happened and I’ll always remember walking into my dorm after my 8am class and hearing the same newscast on everyone’s televisions with all doors open to the hallway. It seemed as though we watched the television for hours, the same images repeating over and over. I never thought then that I would live in NYC or that a view from my apartment could be so beautiful or so meaningful. This photo was snapped just a couple of weeks ago. I was in my studio apartment in Hoboken for the last time gathering the last of my belongings, anxious to get back to the city and start my next journey. I didn’t even want to take the photo, I was in such a rush. But B convinced me to take a moment and look at this beautiful city that we live in. So we did — I snapped this picture and I’m so glad we took that moment because this city is simply amazing. Those of us who are lucky enough to call ourselves tride and true New Yorkers should never forget that! There has always been a special place in my heart for NYC and especially the site of the World Trade Centers. Living in NYC during college and beyond, our youth was spent watching those buildings being built and sharing the view of the City from the top with family who visited. 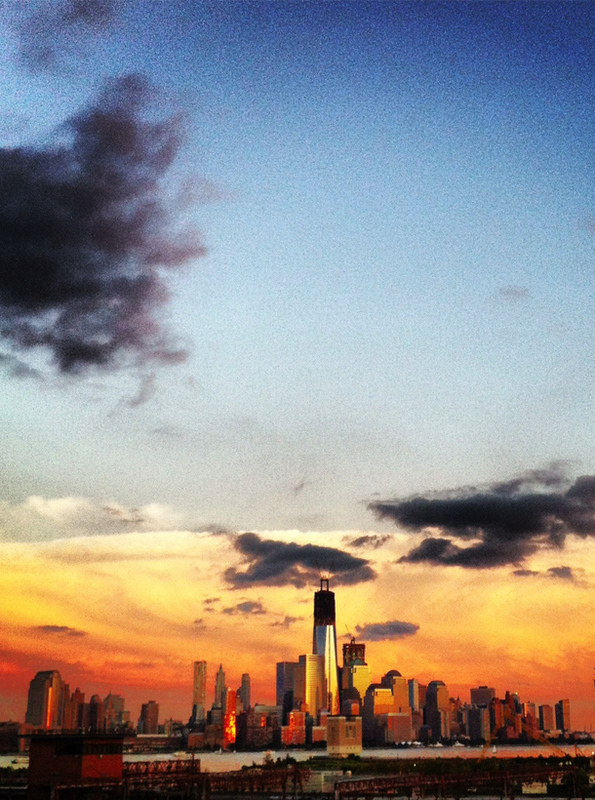 The new Freedom tower is now your link to that special place. May we never forget those that we lost on 911. Your photo is beautiful!